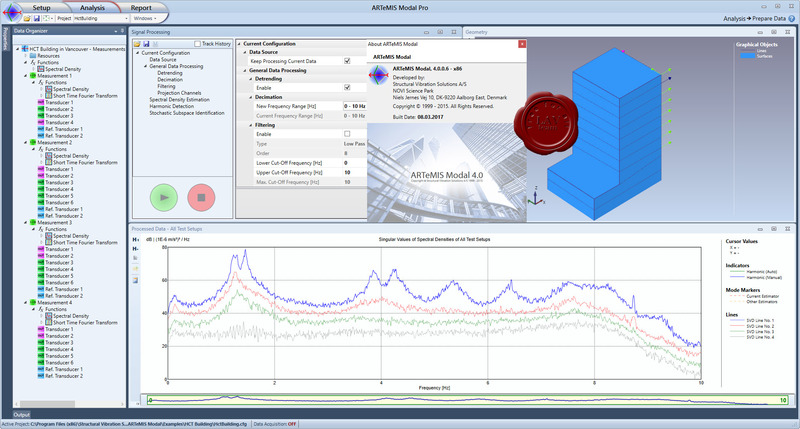 The ARTeMIS name stands for Ambient Response Testing and Modal Identification Software. It covers all the tools an engineer needs to perform a high quality modal analysis without knowing the forces acting on the structure and while the structure is in operation. This technology is in general known as Operational Modal Analysis. Operational Modal Analysis is also called output-only modal analysis, ambient response analysis, ambient modal analysis, in operation modal analysis, and natural input modal analysis. No matter which name that is used the idea is the same: To do modal analisys without knowing and/or controlling the input excitation. This new modal technology is capable of estimating the same modal paramters as the traditional known techniques. The modal parameters are the mode shape, the natural frequency and the damping ratio. Some thinks that Operational Modal Analysis just is another name for Operating Deflection Shapes, ODS. This is not the case. Operational Modal Analysis separates noise and input and returns the modal information only.